Here in Massachusetts, revitalization of the Gateway Cities has been a topic of discussion for years. A new report by MassINC shows that cultivating a thriving creative community is a great way to bring prosperity and life back to these cities. In April, MassINC, with the Massachusetts Cultural Council and the Executive Office of Housing and Economic Development, sat down to think about the meaning of art. No, not what art is but what art does. The research team focused on creativity's ability to revitalize communities and encourage economic prosperity though a process they refer to as creative placemaking. The report emphasizes revitalizing cities and creating communities that are attractive to talented individuals by fostering distinct cultural activities, a tolerant mindset, and a visually pleasing and welcoming cityspace. After the meeting, MassINC put together a report on how, exactly, all that could be achieved. 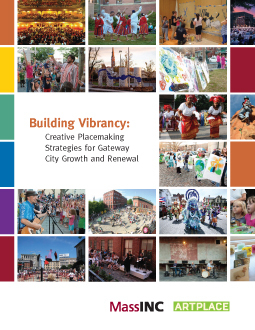 The report, titled Building Vibrancy: Creative Placemaking Strategies for Gateway City Growth and Renewal, was released in late July and has been a huge part of what we've been doing here at MASSCreative. The report outlines how Gateway Cities, defined as the cities and communities that drive regional economies outside of Boston, can succeed using creative placemaking. In the case of cities like Lowell, Worcester, New Bedford and Pitsfield, the report recognizes achievements of this strategy and highlights specific efforts that are encouraging these communities to flourish. By stating the argument for creative placemaking, cataloging current efforts in the Commonwealth, acknowledging the challenges and, finally, outlining strategies for creating robust creative placemaking policy, the MassINC report makes the argument that creativity, art and culture are driving rebirth and revitalization in various communities around the Commonwealth. And we think they're quite right. Read the full MassINC report here.